Janet Mae (Kreisher) Henderson, 81, widow of Robert Thomas Henderson, of 607 David Street, Staunton, passed away Thursday, November 15, 2018 at Augusta Nursing & Rehabilitation Center in Fishersville. Mrs. Henderson was born on March 11, 1937 in Lewistown, Pennsylvania, a daughter of the late Robert and Mildred (Venerick) Kriesher. 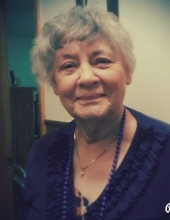 Janet was an active member of Calvary Assembly of God where she enjoyed playing the piano, and worshiping the Lord. She was a loving wife, mother, grandmother, mother-in-law and will be remembered for her unconditional love for her family. In addition to her parents and husband, Mrs. Henderson was preceded in death by her step-mother, Minnie Kriesher; mother-in-law, Elsie Lowe Henderson; father-in-law, Willie Thomas Henderson; and two brothers-in-law, Rev. Orville Thomas and Archie Bailey. Surviving are her daughters, Tammie Renee Thompson and her husband Larry, and Sandra Henderson both of Staunton, and Marie Mowbray of Stuarts Draft; two sisters, Lucille Thomas of Bastrop, LA and Lois Greene and her husband Jim of Winchester; four grandchildren; Erin Landes and her husband Dustin, Justin Thompson and his wife Ashley, Eric Thompson and his wife Jessica, and Kevin Thompson and his wife Donna; four great-grandchildren; Haidyn Alexis Thompson, Adalynn Belle Landes, Caleb Mawyer, and Lucas Thompson; special friends, Rosemary Shaw and Nancy Painter Martin; extended grandchildren, Jenny, Katrina, Jeremy, Jesse, Benjamin and Shay and a number of nieces and nephews. The family will receive friends from 6:00-8:00 p.m. Tuesday, November 20, 2018 in the Coffman Funeral Home and Crematory. A Celebration of life will be conducted 2:00 p.m. Wednesday, November 21, 2018 in Calvary Assembly of God, Staunton by Pastors, Kevin Persinger, and Larry Strickler. Burial will follow in Augusta Memorial Park, Waynesboro. Active pallbearers will be Larry Thompson, Justin Thompson, Dustin Landes, Jim Ashby, Marvin Strickler, Terry Hall, Jerry Greening, and Fred Stephenson. Honorary pallbearers will be Dwayne Burns, Jonathan Shenk, Reverend David Whitesell, Eric Thompson and George Price. To send flowers or a remembrance gift to the family of Janet Mae (Kreisher) Henderson, please visit our Tribute Store. "Email Address" would like to share the life celebration of Janet Mae (Kreisher) Henderson. Click on the "link" to go to share a favorite memory or leave a condolence message for the family.